Although this Mom doesn't seem to have the time to enjoy riding my bicycle as often as I used to, next to swimming, biking has long been one of my favorite physical activities and an excellent way to stay in shape. For me, once I find my 'zone', I have often been amazed by just how far and how long I can go. Even so, my long distance efforts are measured in tens of miles, unlike others who take long distance biking much more seriously. My father is one such example, having cycled in the annual Dalmac tour, from East Lansing and over the Mackinaw Bridge into Michigan's UP multiple times. While I have participated in swimming for pledges events in the past, I've not yet cycled for good. Recently I learned of a group of dedicated cyclers who have been peddling for a cause, the Ohio CycleWorks race team. The CycleWorks racers have been making their way cross-country, from Oceanside Pier in California to City Dock in Annapolis, Maryland as participants in the Race Across America (RAAM) to benefit the Akon Children's Hospital. This 3000 miles trek is not considered a 'tour' by those who participate, rather this route is 30% longer than the Tour de France, across twelve states and involving 170,000 feet of grueling 'climbing'.1 The Ohio CycleWorks team is not without heartfelt motivation to tackle this challenge. Through their journey, they are hoping to inspire contributions to the Akron Children's Hospital with a goal of raising $100,000 to help children. The group will also be making a donation of bicycles to promote health and fitness for the children of Northeast Ohio. Keeping track of the progress of this important trek has been simplified by the team's partnership with FedEx Custom Critical and their SenseAware technology. From the start of their journey on Saturday, June 16, 2012 in California, across the states and to the finish line today in Maryland, the CycleWorks race team has been packing SenseAware devices courtesy of FedEx. 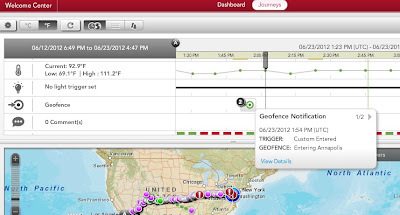 The tracking technology of the SenseAware system is nothing short of fascinating! 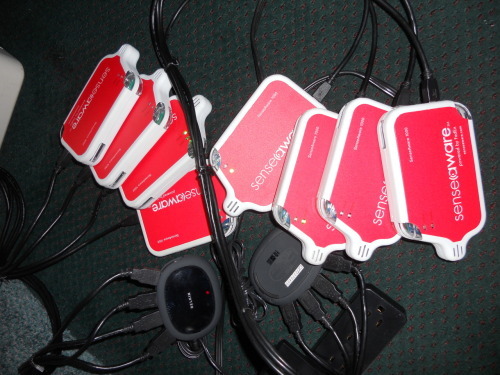 In addition to following the team's progress cross county on their Tumblr site, with updates from Scott Garchar, board member of the CycleWorks group, I've been able to follow the team's progress through SenseAware. With FedEx's reputation as a leader in tracking and movement, its not surprising to see this level of sophistication from them. What is surprising is the level of detail and the number of features this new system provides. Through the SenseAware tracking system I was able to literally able to follow the Ohio CycleWorks Race Team across the country, selecting from a number of different 'views' of their trip, including details of the environment (weather, humidity, temperature) they traveled through, pinpointing the specifics of their location at any given time as well as staying updated through live updates. The potential applications for this tracking system are endless! From important life saving organ transportation down to sensitive packages, I found the ability to see so much detail in progress intriguing! With near real time feedback from the road, it was such an interesting experience to be able to monitor the team's progress! SenseAware® powered by FedEx, a comprehensive tracking and monitoring service integrated with a powerful web-based application, provides real-time data about customer shipments. Customers can stay connected to their shipments by viewing vital statistics such as current location, temperature, barometric pressure, relative humidity and light sensitivity. Side Note: This Mom wants a SenseAware device for my luggage when I fly; I'm always terrified my luggage will be lost! 3000 grueling miles, through temperatures up to 111° F the Ohio CycleWorks Race Team reached the finish line in Annapolis, Maryland on Saturday, June 23, a mere eight days after their journey began in California on June 16th! Just shy of their goal to raise $100,000 for the Akron Children's Hospital, there is still time and need for you to show your support of this tremendous effort! Learn more about the Ohio CycleWorks Charities, the Pedaling For Progress campaign and how you can make a modest or generous donation to help promote children's health and fitness at the CycleWorks Charities website. Do you and your family participate in any events for charity? What is the longest distance you've ever cycled? Let's hear it for the Ohio CycleWorks Race Team! What do you think about their journey and charitable efforts? Tell me all about it! I'd love to hear your thoughts! I received compensation from FedEx for covering the use of SenseAware® technology during the 2012 Race Across America. My ideas and opinions relayed in this blog post and any related Twitter discussions are the my own and are not provided by FedEx or its affiliates and subsidiaries. The opinions above are both mine and of my own experiences. Some information and images sourced from various sites associated with FedEx, SenseAware, Ohio CycleWorks, RAAM and Akron Children's Hospital. This post is published in association with Mom Central Consulting #MCC. I love the Santa feel after Fedex leaves my house! Now I have one more reason to feel warm and fuzzy about them. All about supporting those that make efforts toward social change. For now I do walk-a-thons and try to be the best team cheerleader. I do walka thons for Cancer awareness sometimes. This is a great cause. What a great cause and what super cool technology! When my husband and friends do their tri's I like to try and follow along on the computer! It's so amazing! So cool how far technology has come! Great cause too! Loved your post..There are so many great causes out there.